Even the best of intentions to keep your perfect martini chilled can fall miserably short. But wait... has Swank Martini Company found the ideal solution to the Chillin' problem? Of course! 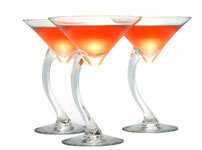 The New Chillin' two-piece martini glass keeps it cool and swanky. Note: 2 pack includes two tops and two bottoms, etc. Send Chillin' - Martini Glasses postcard to a friend!